Fuel a child's love for books, drawing and storytelling with IlluStory, a complete kit for writing, illustrating and publishing their very own hardcover book. 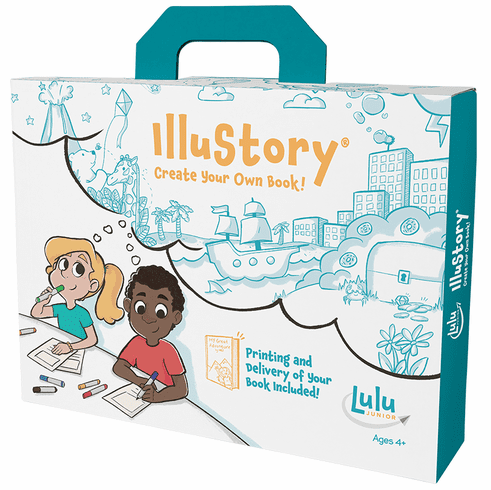 Lulu Jr. book-making kits have been a top choice for creative children since 1993 and brings your child's imagination to life through the fun and educational process of making their own book. This kit is an ideal gift for children and adults who want to explore their imagination and creativity through publishing their very own book! IlluStory is the winner of over 15 educational, parenting and toy awards including the 2017 Mom's Choice Gold Award, 2017 Tillywig Toy Award Winner - Best Creative Fun, 2017 Creative Child Magazine Product of the Year Award - Create Your Own Books category and 2017 Creative Child Magazine Creative Play Award - Creative Play with Stories Category.